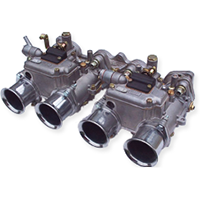 Part number: CB2726 Category: VW manifold parts. Tags: adjustment, Aircooled, all, ball, base, bearings, Bell, Bellcrank, carburettor, CNC, Compatible, Crank, CSP, Dell'orto, Dual, easy, engines, enlarged, exacting, fan, FRD, Germany, housing, ICT, Installation, Internal, kit, kits, Left, levers, linkage, linkages, machined, manifolds, manufactured, market, may, models, mounting, operation, pushrods, range, reliable, rev, Right, roller, smooth, spindles, stainless, standard, standards, steel, threaded, threads, throttle, throughout, type, Weber. A manifold gasket for Porsche 356/912 engines made by CB-Performance. The gasket is included within this manifold kit.